Rockstar details exactly what videos will get taken down and what won't. A general rule on the internet is that when you tell someone not to do something, five more start doing it too. Even with a big stick like the DMCA, it can be an unwinnable game of whack-a-mole for even the largest corporation. Even so, Rockstar's laying down the rules for videos from its fresh-off-the-line crime simulator Grand Theft Auto V. In short, Let's Plays are fine, but spoilers will get you flagged for removal. 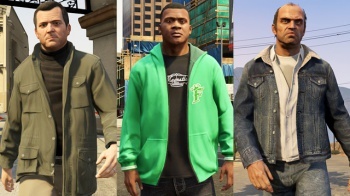 There are three main things that will get a GTA 5 video pulled. First, no footage of any kind, even an unboxing, before the official release date. Second, in-game entertainment, like the TV shows, will also get pulled, as Rockstar claims that it would "prefer fans to experience these in the context of the game's world". Lastly, anything involving spoilers, including ending videos and cutscene montages. Now, Rockstar makes an exception for the spoilers rule to allow for Let's Plays. As long as it includes narration, or is part of a larger gameplay video, it's ok to post. Also, it's not cool to take a screenshot and slap it on a t-shirt and sell it, but that should go without saying. Of course, Rockstar also maintains the right to change these rules however they please, just in case anyone gets too clever for themselves. Most of the rules seem pretty standard, but it seems pretty common to post the ending videos. We'll just have to wait and see how these rules play out in the long run.